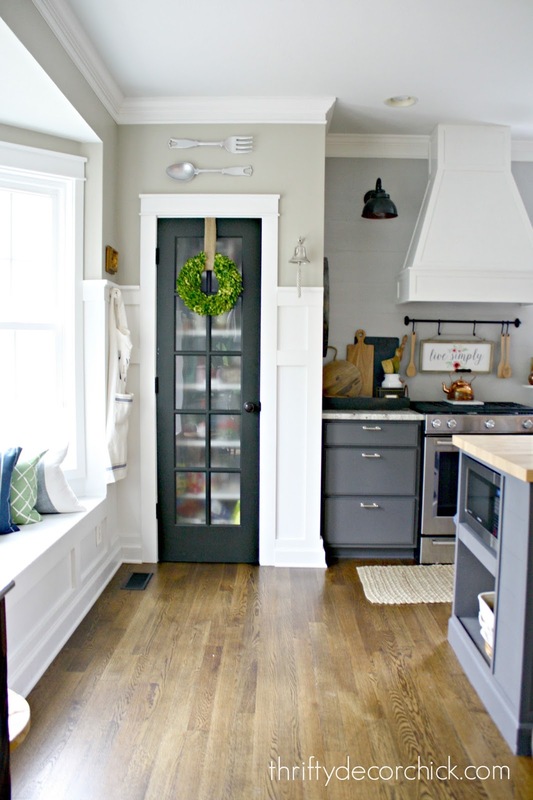 How to create a functional (AND pretty) pantry! There was absolutely no rhyme or reason to any of the shelves -- I quite literally just filled them up and knew I would deal with it at some point. 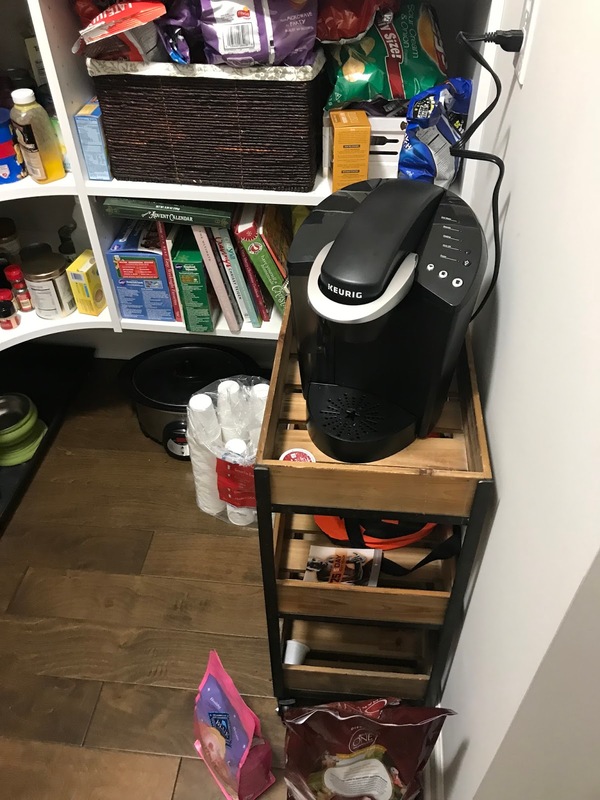 I was so excited to be able to add an outlet in here -- I planned to keep small appliances in the pantry instead of on the kitchen counters. Well when decided on placement of the outlet, I didn't think to ask how the shelves were going to be hung. So the outlet isn't on a wall where we have shelves. Wahhh wahh. I've figured out a solution to that (crossing my fingers it works) and plan to tackle that project soon! This took FOREVER to organize. Well, at least most of a day. There's a TON of stuff in there! But when I have the time I find this kind of project cathartic and dare I say, even a little fun. I'm weird. Goodness it is SO much brighter in here! And the dimmer makes it so we can keep the light low for the animals in the evening. I used it in our powder room in the old house and almost got rid of it because I didn't have a spot for it here. 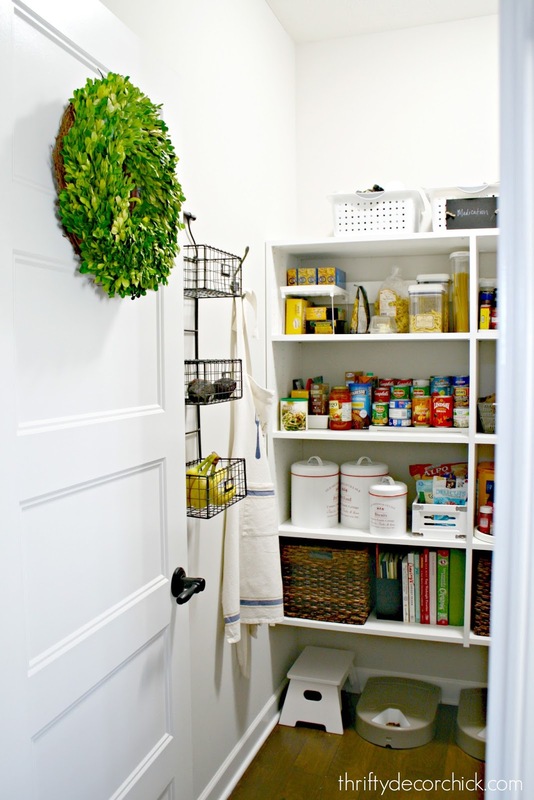 I'm so glad I thought to hang it because it's GREAT for a pantry! 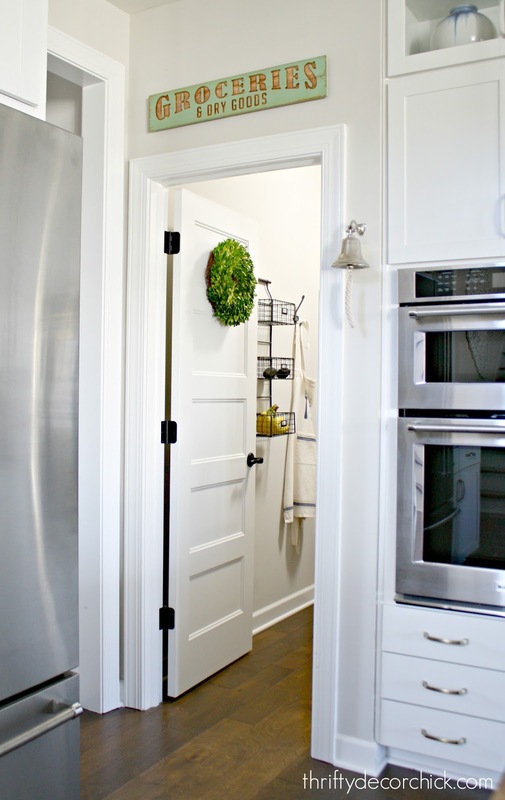 It lets the air flow and gives us easy access to things like oranges, avocados, potatoes and bananas. By that I mean anything that we keep in containers went over here like pasta and that jazz. 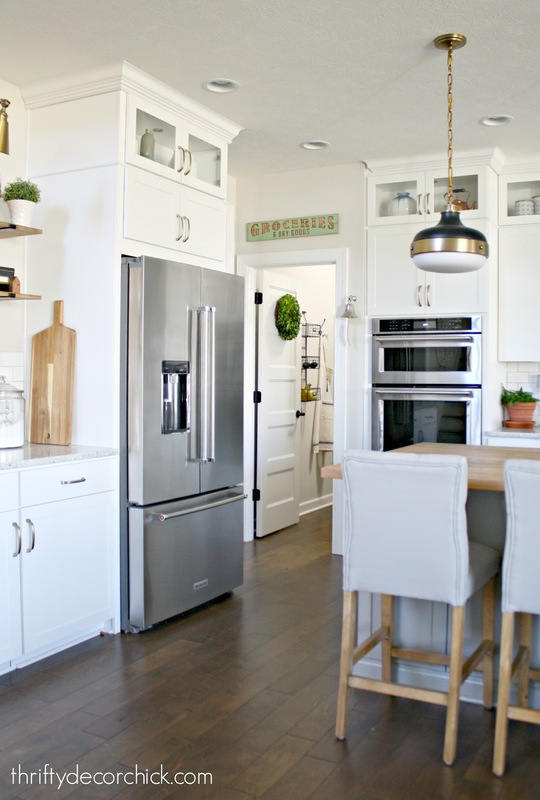 I guess I should warn you -- this is NOT one of those gorgeous pantries that you'll drool over and then go -- "But WHERE is the food?" Ha!! I love those as much as the next person, but I've really gotten away from keeping so much in containers. For some items I love it -- for others I just don't find it to be helpful. And by the way -- I figured out where to put those cute herb/kitchen printables I showed you last weekend. I'm going to find some frames and hang them above this line of shelves! I put anything pasta-related at the top -- I like pasta in containers just because they're easier to organize than the bags. Most canned items (for dinners primarily) and boxed meals are here for easy access. Our animal food goes into containers because we just find it easier to scoop from these instead of pour. And our dog only gets a measured amount each feeding. These keep the food nice and fresh too -- more so than bags I think. The next row of shelves is where the bulk of the food is. Again, I wanted the stuff we reach for most to be closer to the door. 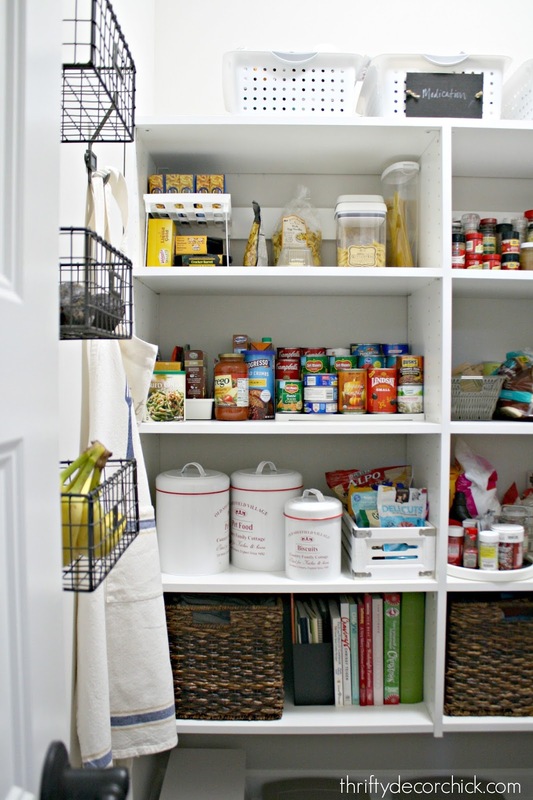 Spices and cooking oils are layered on top with tiered organizers like the canned goods. These are life savers!! They make it so much easier to see what you have on deeper shelves. Breakfast stuff is on it's own shelf. I keep packets of hot cereal in a basket so we know when we're running low. Baking necessities and sweets are on the next shelf. I tried to keep the foods we reach for the most often on eye level. I don't bake that often so those are best a little lower. As we move around we get to less food and more appliances and paper goods. This corner spot is nice and deep and holds a TON, but it's also harder to get to. In hindsight I would have asked for the corner to be squared off so these aren't so deep. But I'm not complaining! 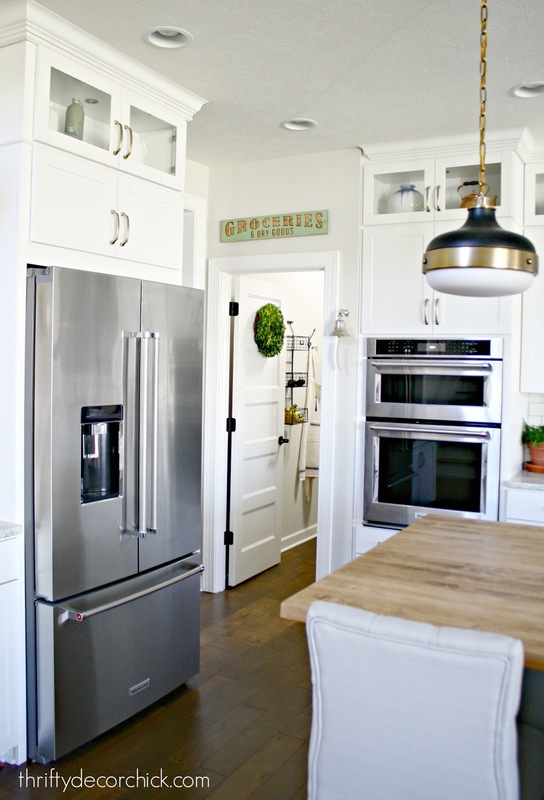 Our small appliances that I use IN the kitchen are on the top shelf -- meaning those that I take out and use on the counter. This will make more sense in a minute. Next shelf is alcohol -- I know it looks like a store. 😂 We used to keep most alcohol in our basement, which was nice, but we would buy more of what we already had because...out of sight, out of mind. We keep extra lime juice and mixes here too. The next shelf is stuff we grab for lunches -- peanut butter, crackers, bread. In the bin I have the small lunch-sized stuff like chips. It makes it super easy to pack our boy's lunch in the morning! And finally, the side I'm most excited about! I moved the shelves around here a bit to make this work. The third shelf is for appliances we use in the pantry -- and I have a project in mind to make this even more functional! I'll let you know if it works out! You can see that the outlet is on the wall to the right. 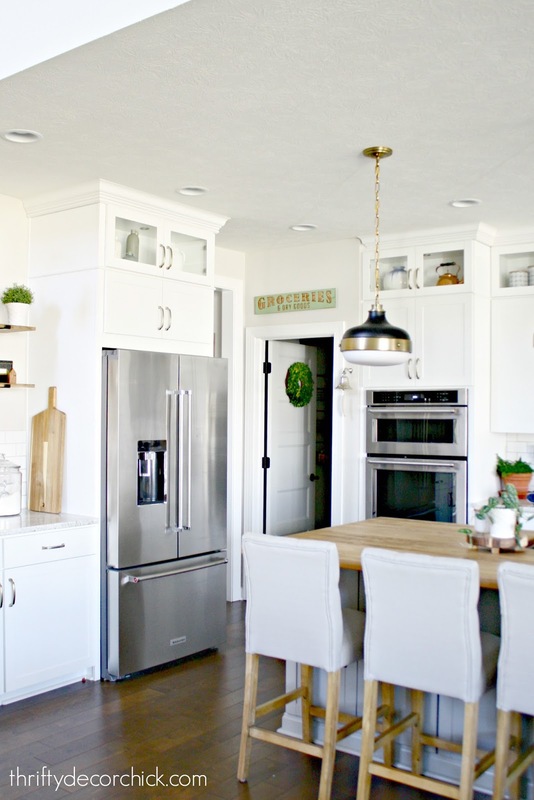 This room is the smartest and most functional in the house and I LOVE it! I love it even more now that we can find exactly what we need when we walk in. And it's so much nicer when we're putting stuff away too. I should've done this a long time ago! There you go! This space is finally organized and working well for us! During the process I was a deer in headlights at times -- I would just stand in there and stare at the mess. But if you slow it down and really think about how you USE a space, it's easier to work it out in your head. And it found it helpful to remove EVERYTHING off the shelves -- every counter in our kitchen was covered! Then I went by section and added everything back in. I gave the shelves a good cleaning too. 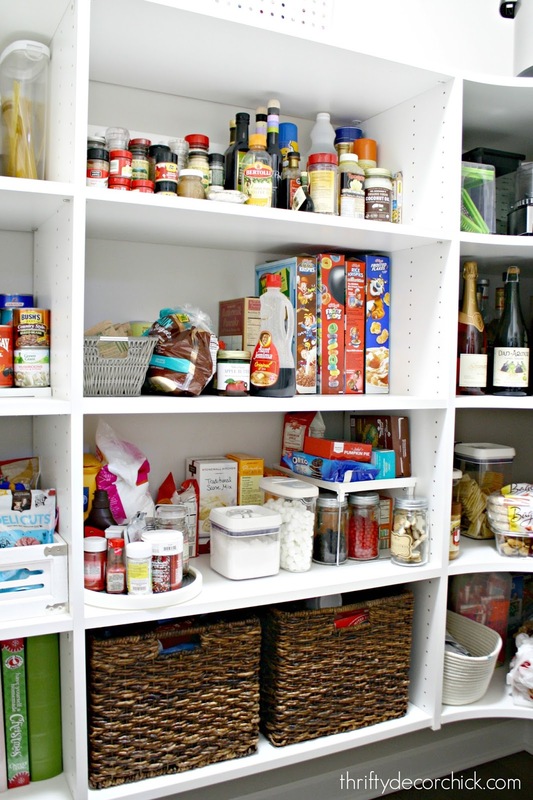 I would move all over again just for this pantry. :) It's amazing -- I love that we can keep more than just food in here. I did get rid of a few things and moved just a couple items to the basement. But overall what you see in the befores is what is in there now! We also keep the dog and cat food in this room (on the floor). I can't find my sign online but this one is super cute and has the same wording! 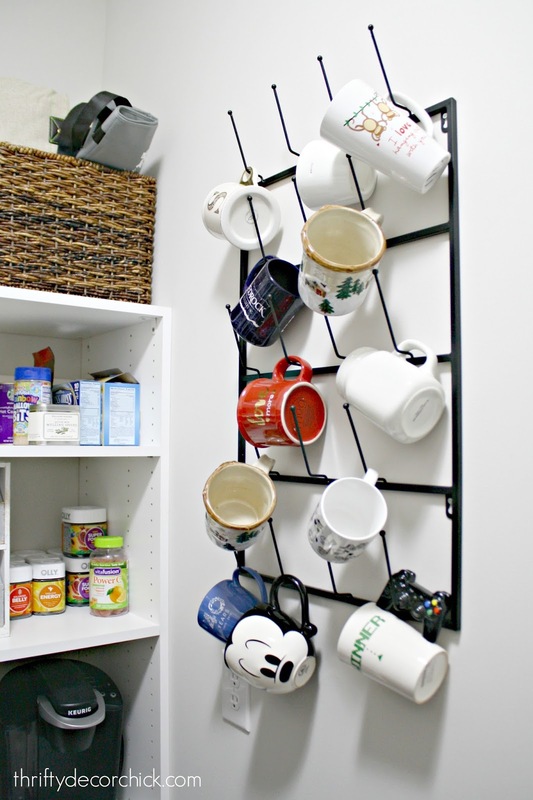 I got the mug rack here -- most versions with good reviews in this design were SO expensive! This one still wasn't cheap but better than others (read reviews because some have hooks that are too close together and getting mugs on and off is difficult). The baskets were from Target (I used them in our basement cubby storage) and they don't sell these exact ones anymore. These are SUPER close though -- same size and materials. 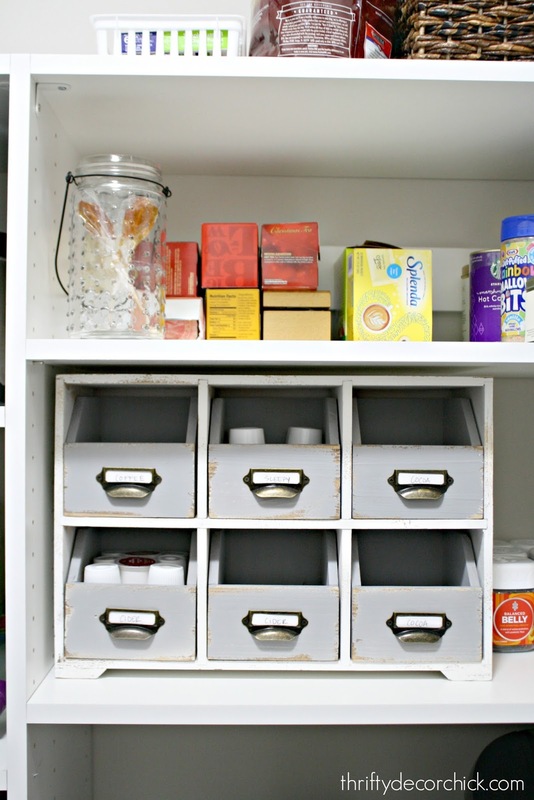 These are the tiered can/spice shelves -- LOVE them and they make organizing these items so easy. This round spice caddy is a favorite too -- it turns so you can find what you need. You can see more about our timed cat feeders in this post! I got my hanging wire shelves from HomeGoods but this one is very similar as well. The wood and metal rolling cart we had in there was from World Market. 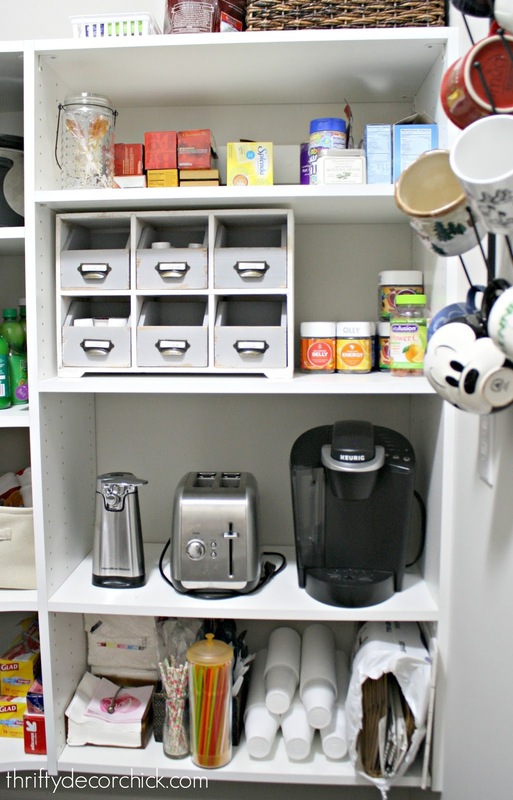 If you'd like to see more about how I organized our old pantry, check out this post! Looks good. When I saw that extra space up high, I was also thinking about the need for some art and I think that the herb ones would be great. Have you considered putting a small 12 bottle wine rack on the top part? I sometimes buy wine by the case to take advantage of a discount and to get a variety of wines. Concerning the electric outlet - do you other areas where you want to add outlets? If so, consider bringing in an electrician to add them. I had some added in hallways but they were placed in the same section of studs so it was easier to access current lines. In one case, the light switch was on one side of the wall and they put an outlet on the other side. 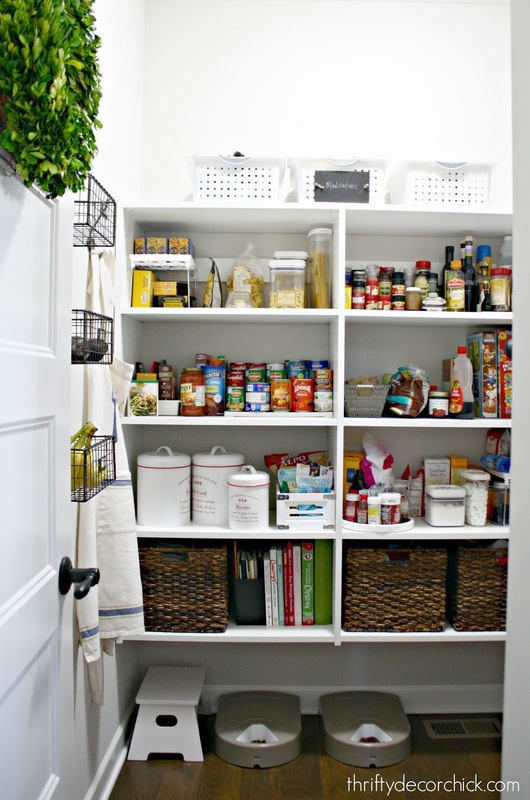 I got the same sign for my pantry from Michael's, just in case you want to find a link to give your readers. I have the groceries sign from Michael's too! A cheap fix for the outlet use a surge protection bar. It'll plug into the outlet and the cord will reach to the shelves & have multiple outlets to plug the appliances into. Looks great! On both the pasta shelf and the baking shelf there is a little portable shelf. Do you have the source for those? I wish I could remember! I think maybe the Container Store? Oh my gosh it looks AMAZING!!!! I love the added touch of the boxwood wreath even! Great job! 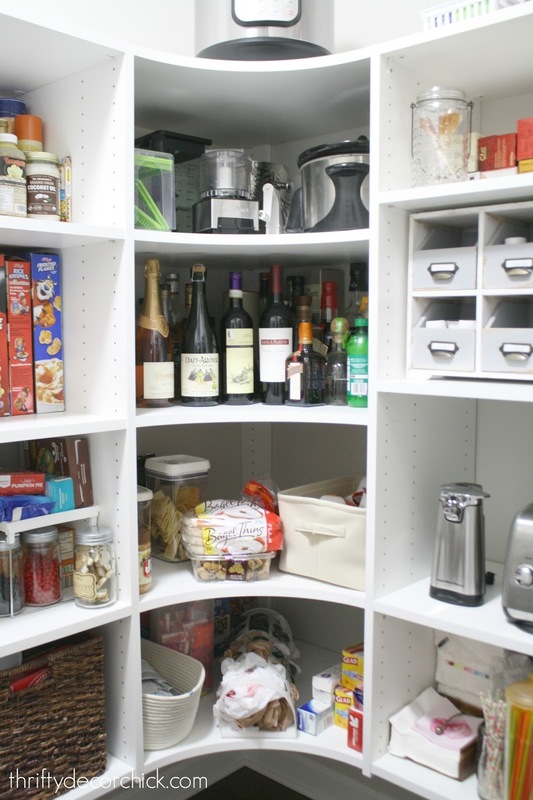 Now I'm definitely avoiding looking at my pantry closet ... located in the 1st floor half bath! Looks great! Please tell me where you bought your pendant lights. I love them! 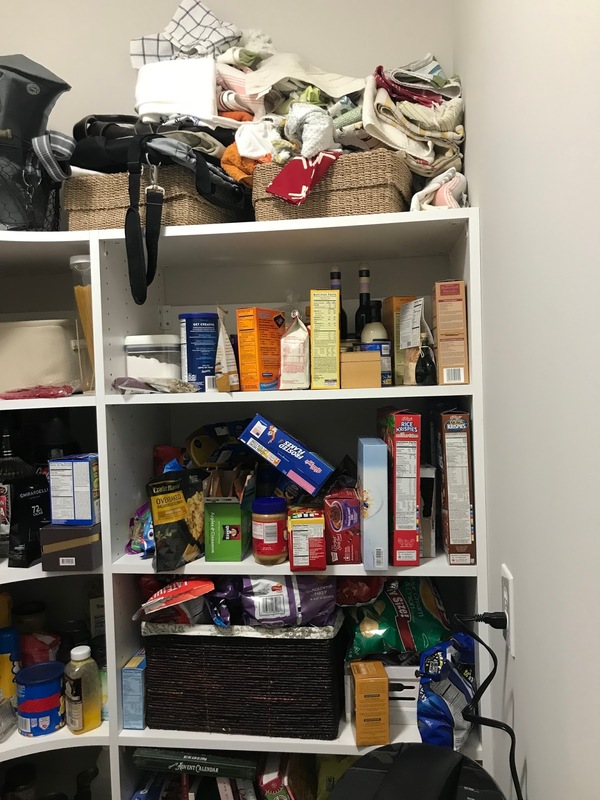 I just moved into my new houses a little over 5 months ago and my pantry looks like your before pictures. Still not organized. The size is beautiful but it's my "room of shame" right now because it's so untidy. I look forward to taking many of your suggestions, clearing out and making it look great. 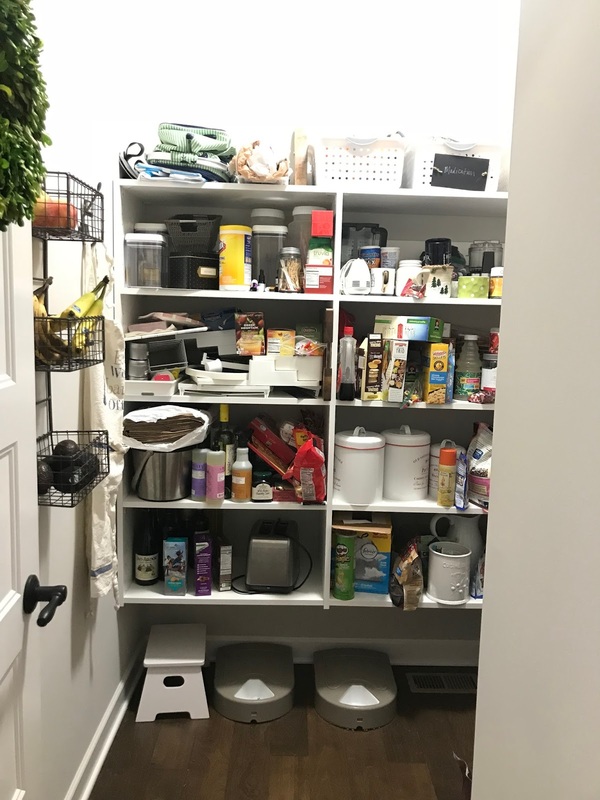 I never had so much space for pantry items. 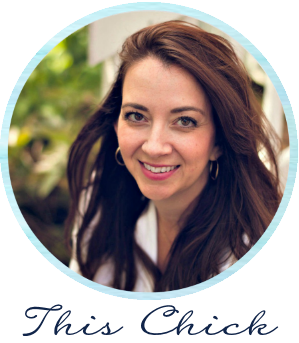 Loved reading your article.